This thread demonstrates the use of tgextract2 to apply customized background regions to an LETG/HRC-S observation of a field with two, close, bright sources. With LETGS, it is important to include backgrounds in the analysis since the HRC-S instrumental background is significant. Each source in the sample data (ObsID 29) falls into one of the default background regions for the other. The sources themselves are far enough apart that their spectra can be extracted cleanly. Creating a custom region will avoid background contamination by either of the sources. Some detailed and interactive analysis is required, involving some scientific judgement by the analyst, to determine the background region to apply. tgextract2 is an alternative to tgextract, the CIAO tool which filters and bins spectra. tgextract2 provides support for variable-shaped background regions which do not need to have a constant width ratio with the source region. tgextract2 computes a vector "backscale"—the scaling factor which relates the background count rate at any wavelegth to the source extraction region width at that wavelength. tgextract2 also sums the background extractions from each side of the spectrum, whereas tgextract writes two counts arrays, one from the "_UP" and one from the "_DOWN" sides of the spectrum. Since tgextract2 is not backward-compatible with tgextract, it is not used in standard processing. It is instead recommended for special cases where some detailed and interactive analysis is required, involving some scientific judgement by the analyst. Next, we set the height and width to something convenient for grating spectra, and adjust the colorscale and colormap in the DS9 menu. Figure 1 shows the resulting image. Binning parameter settings applied in DS9 by going to the menu and choosing Bin → Binning Parameters. The binning was iteratively chosen such that the field fits the screen and it has enough counts/bin to give good statistics. Fiddling with parameters, we start off with knowing that the tg_r coordinate range is -1 to 1 degrees in about 10000 bins, or 0.0002 deg/bin. Binning by a factor of 10, we have a tg_d range of about -0.002 to 0.002 deg/bin. This is the image in grating dispersion coordinates with tg_r (in-dispersion) on the horizontal axis, and tg_d (cross-dispersion) on the vertical axis (both in degrees). We can clearly see the two sources zero-orders near physical coordinates (0,0) and their dispersed and line-rich spectra, with negative-orders to the left and positive-orders to the right. 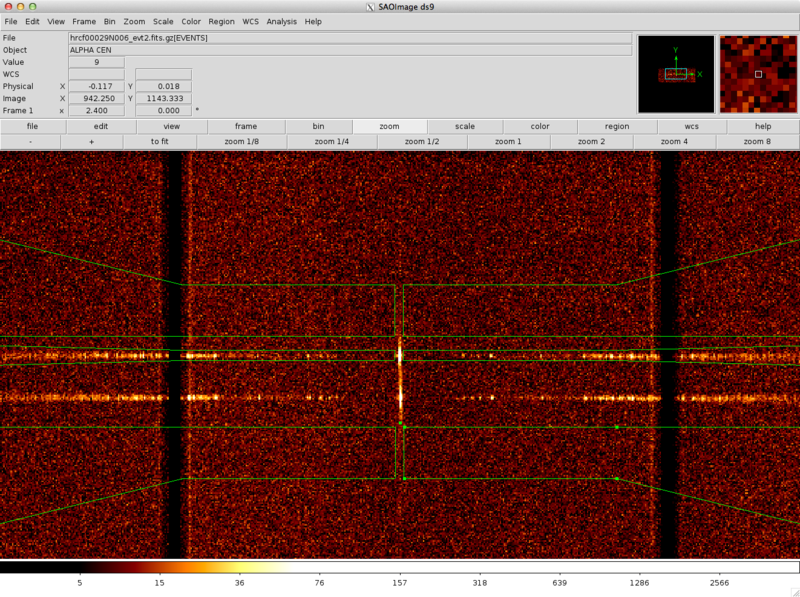 The vertical dark regions are gaps between the HRC-S microchannel plates. 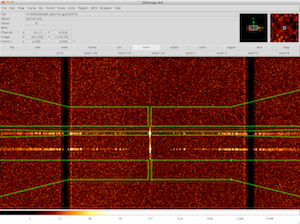 Overplotted is the standard LETG extraction region, where, in this case, the lower background region includes the spectrum of the second source and therefore should not be used. The standard HRC/LETG extraction region file must be edited for the current field. This is most easily done in DS9 as long as the information about which region represents source and up and down background is preserved. The tgmask2reg and reg2tgmask scripts allow the use of DS9 to define custom extraction regions, and use the DS9 region "tagging" feature to encode the grating information along with the extraction region coordinates. The first step in the editing process requires running tgmask2reg to convert the CALDB tgmask file into a DS9 format. The additional (non-coordinate) columns in the CALDB files are added as "tags" so that later tools know each regions' purpose. Once the region is loaded into DS9 (Region → Load Regions → tg.reg), it can be customized interactivelty as needed either by moving points or adding new ones both for the source and the background areas. Note that polygon regions cannot added or deleted. They can only be modified. This ensures that the needed meta-data is preserved. Note that in DS9 regions can be inspected to see the extra information associated with each region by going to Region → Groups . This will provide a list of the different tags in use. Selecting one of the tags will show and select the corresponding region(s) in the main ds9 window. The final customized set of regions must be saved in DS9 format in physical coordinates (Region → Save Regions → ds9.reg) (see Figure 4). This is the modified extraction region for source and background: the lower background regions have been moved well away from the second source spectrum while the source region has been left unaltered. Finally the reg2tgmask tool converts the modified region ("ds9.reg") back into a FITS format ("tg_mask.fits") compatible with tgextract2. With the background regions appropriately defined, we are now ready to run tgextract2. The opt parameter is set to "pha1" so that the tool creates separate files for the +1 and -1 spectra (Type 1 PHA file), rather than both spectra be written as rows in the same file (Type 2 PHA file); see the grating spectra data products guide for more information these formats. The files will also contain the background extractions and the "areas" (BACKSCAL) of the source and background regions for each spectral bin. The outfile parameter value (a_) is used as the root name of the output files. The files will be named as "root<srcid><part><order>_pha2.fits", one for each source ID, part, and order combination. This produces two new files, a_01Lm1_pha2.fits and a_01Lp1_pha2.fits, which are -1 order and +1 order LEG spectra, respectively. You can check the parameter file that was used with plist tgextract2. After we run tgextract2, we will copy the background counts to a separate file, one for each order. This is because various analysis softwares typically need to have the background spectrum formatted the same way as the source (i.e. having the same column names). We will now inspect the counts and background spectra. Using Sherpa, we will create a strip-chart displaying the plus- and minus-order counts spectra, with background over-plotted. 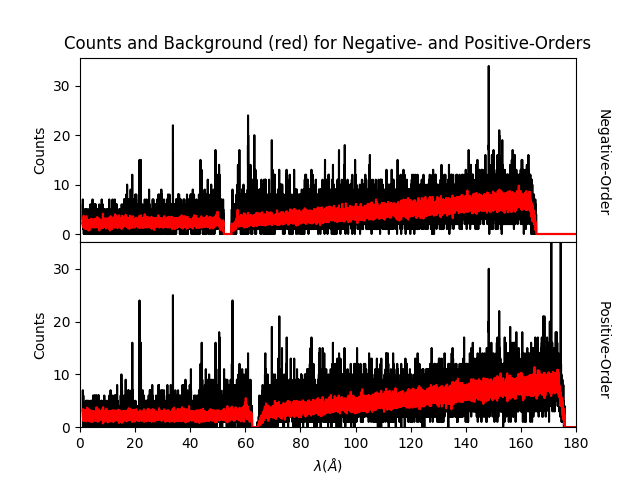 We begin by loading the data and background with the minus-order spectrum associated with dataset ID=1 and positive-order spectrum associated with dataset ID=2. Next we set Sherpa and ChIPS; plotting preferences. 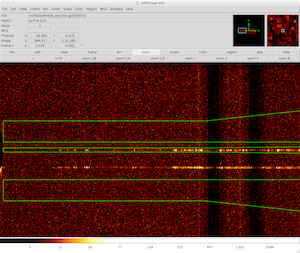 The key parameter is set_analysis, which plots the spectrum as counts vs. wavelength. Now we populate the lower plot with the plus-order counts and background spectra in the same manner, by first setting current_plot("plot2"). The results of this plot can be seen in Figure 5. 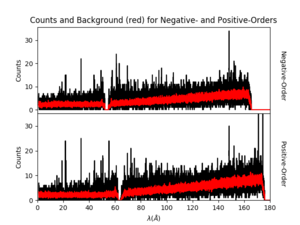 Strip chart of the spectra of counts (white) and background (red) with negative orders in the upper frame and postive orders in the lower frame. Before exiting Sherpa, you may want to write the plot to a file. In this example, we use the interactive print dialog. Note that print_window automatically inverts black and white for PDF and postscript formatted files. we change the parameters to bin on wavelength coordinates (tg_lam,tg_d) (Bin → Binning Parameters). Again, we have to fiddle with our binning parameters, but we have some starting points. 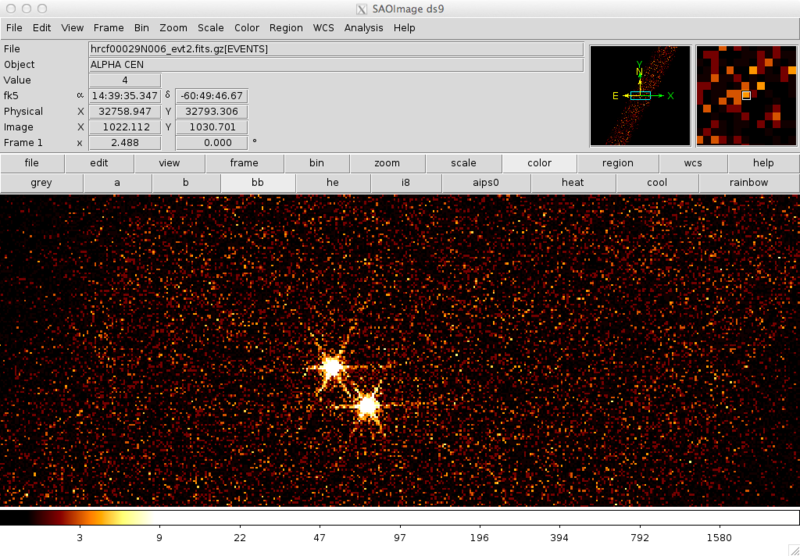 We can keep the tg_d binning of 0.00015 since the cross-dispersion ranges between -1 to 1 degree over about 10000 bins. 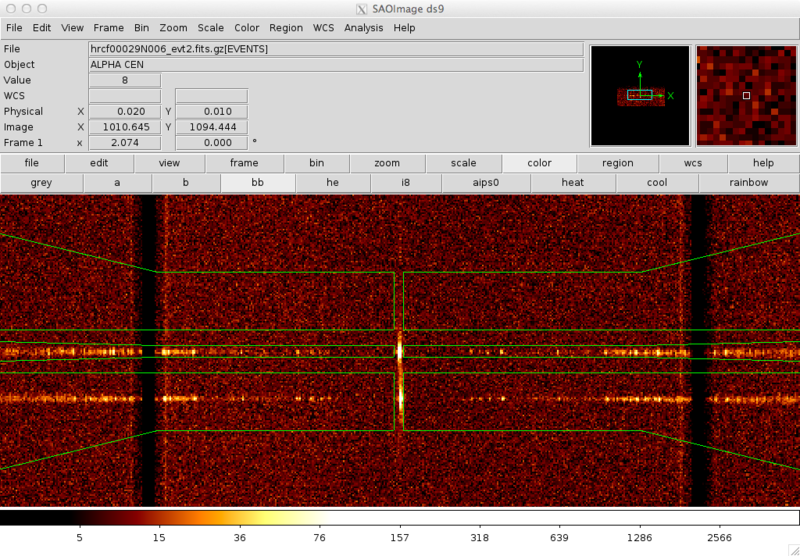 The nominal wave-band coverage for the LETGS when using HRC-S is ≅150-175 Å. In wavelength, LETGS has 0.015 Å/bin; binning up by a factor of 10, we can get a good plot. Then load the region which is stored in the PHA file, a_01Lp1_pha2.fits[REGION]. Figure 7 shows the events and extraction regions in wavelength coordinates. This is the field image in wavelength coordinates with tg_lam (wavelength) on the horizontal axis, and tg_d (cross-dispersion) on the vertical axis. The region from a_01Lp1_pha2.fits is overlaid, showing the source and background. The file, tgextract2.py, performs the Sherpa commands used above. #  - "all, blank or none" processes all the sources id's found in the event list. #  - a comma list is a comma separated string list of all the sources to process. #  - @file is a pointer to an ascii file which contains the id's to process. #    Limit one id per line. no comma list is allowed in @file. #    the user wants to process. #          eg. "-5, -1, 1, 3"
#  - a range list sets the min and max of the orders to process. #    all the orders in between, will be processed. #    the orders to process. Limit one order per line. #    a range list is allowed in @file, but no comma list. # the following grating-specific parameters 'wav_grid_*' will be ignored. (ignore_source_id = yes)             match source id between regionFile and evtFile? (clobber = no)              overwrite any existing output file? 10 Jan 2012 reviewed for CIAO 4.4: minor update to tgextract2_crates for the updated pycrates module. 03 Dec 2012 Review for CIAO 4.5. Updated sherpa command to use the get_bkg_scale routine instead of getting bscale and expsoure separately. 11 Dec 2013 Review for CIAO 4.6; no changes.